A fun first guide to how to tell the time, this bright and bold lift-the-flap activity book features a clock with moveable hands! Telling the time is a key topic for early learners. 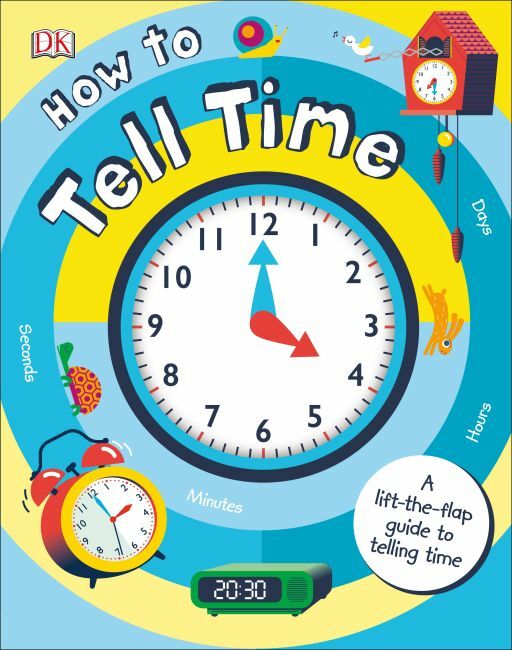 This charming and colourful book helps kids understand the basics of telling the time. Fully interactive, the book features lift-the-flap puzzles that help kids to relate telling the time to everyday life - posing questions such as "It's 8.15 - is it time for breakfast? ", "Does it take 2 minutes to brush your teeth?". How to Tell the Time introduces kids to how we measure time using seconds, minutes, hours, days, months, and years. It gets kids learning to tell and write the time to the nearest five minutes. There is a flap attached to the front jacket that opens to reveal an amazing clock with moveable hands. Quiz questions that relate to the clock are found sprinkled throughout the book, encouraging kids to move the hands on the clock face and tell the correct time. Telling the time is often a subject that children find hard to grapple with. This book is just what those children need, as it tackles the subject in a fully interactive and playful way.